December 1st. Everyone take a big deep breath and let it out in a sigh of relief. 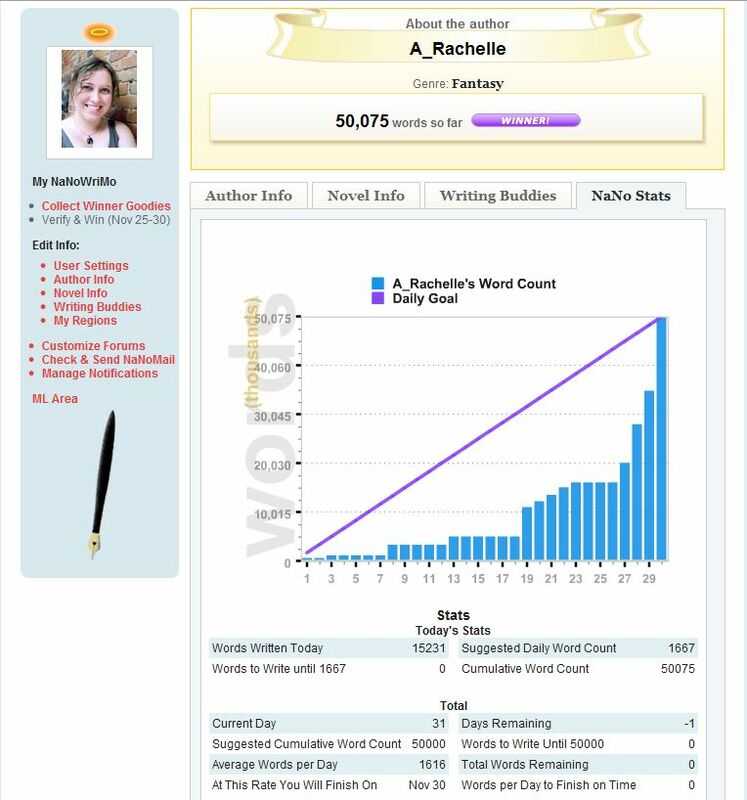 NaNoWriMo 2010 is over. Welcome to the first day of editing procrastination. This was my fifth year participating and every year December 1st is a day of mixed feelings. There is the relief that won or not it’s over. Burn it or build on it – whatever you choose to do from there is totally up to you. If you’re ‘won’ there is a feeling of euphoria that comes from the purple winner bar. Still to come is our 2010 TGIO (Thank God It’s Over) party in which we all celebrate our survival and share war stories. These will be happening in regions around the world over the next couple of weeks. Ours is going to double as a donation drop for the NaNoWriMo Bookdrive which runs until the 15th. NaNoWriMo is just the beginning though. Now comes the editing and the re-writing and the intermittent feelings of brilliance and desire to destroy all evidence that anything was ever written this past month. I made a few major cuts myself before I even went to bed last night (technically in the wee hours of this morning) but am thinking that before I get too absorbed in my editing I should probably do the dishes, water the plants and make my living room look less like a tornado went through it. Maybe. More likely I’ll end up working on that half-finished sweater pinned to my dress form.